that can be as early as March and last well into November. Let’s start with fleas. 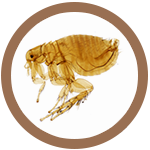 Fleas are tiny, wingless, parasitic insects that feed on warm-blooded animals. The lifespan of a flea is only about two months but some can survive longer, even without a blood source. Besides making your pet’s life miserable, they can be host carriers for tapeworms and can cause serious allergic reactions in some animals. A flea infestation on a very young puppy or kitten may cause anemia which can be fatal. 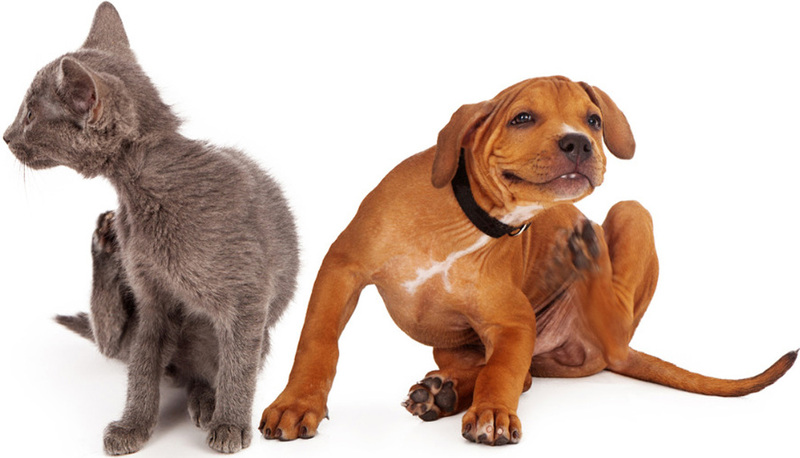 Household pets pick up fleas most often from being outside. Fleas live in grassy areas, on other animals such as raccoons or rabbits, and thrive in warm, dark places. They are jumpers and can jump from one animal to another. So, even if your pet is indoors only, s/he could get fleas at a grooming salon or even at a vet’s office. 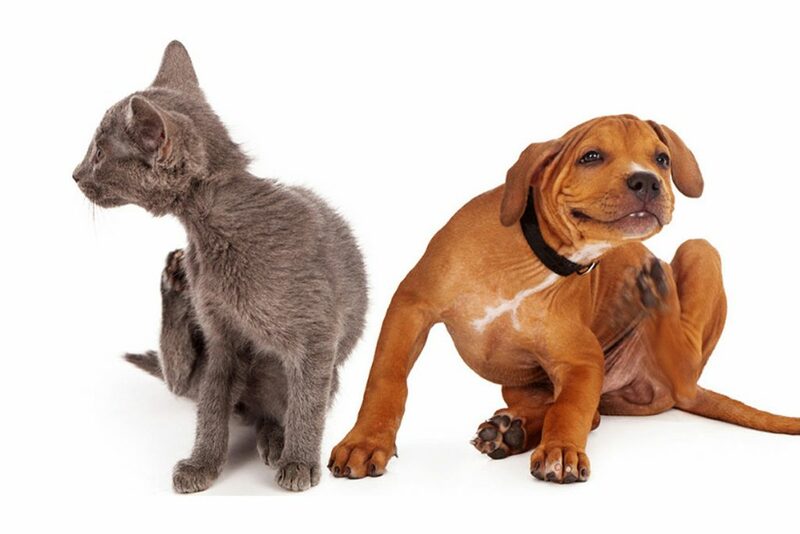 Persistent scratching or licking is the most common indicator that your pet has fleas. To confirm, check between their rear legs where their skin is easier to view; you might be able to see fleas moving about if they are present. You should also comb your pet with a fine-toothed comb and look for “flea dirt”, which is flea feces and which looks like grains of pepper or flecks of dirt. Now let’s talk about ticks. Ticks are blood-sucking parasites from the arachnid family. They feed on warm-blooded animals, including humans. 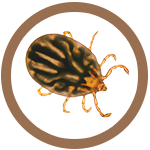 Ticks are much larger than fleas and are therefore easier to spot on your pet. They’re usually found close to the animal’s head, neck, or ears. The lifespan of a tick is typically two to three years and like fleas, they’re most active during hot weather. Ticks are more common on dogs than cats but all animals are at risk of picking up ticks anytime they’re outside. Ticks carry vector-borne diseases and each year, thousands of dogs are infected with serious diseases such as Lyme disease and Rocky Mountain Spotted Fever. The predominant symptoms of Lyme disease are swollen joints, painful lameness or even arthritis. Rocky Mountain Spotted Fever can cause fever and lameness. Ticks carrying Lyme disease are most commonly found in New England, Michigan, Wisconsin, and Minnesota. Although the incidence of Lyme disease is relatively low in SW Ohio, a Lyme vaccine for dogs is available and should be discussed with your veterinarian if your dog spends a lot of time outside in the woods. Follow your veterinarian’s recommendation for one of the many effective topical or oral prescription flea/tick medications. (Never use an over-the-counter product without consulting your veterinarian!) Although fleas and ticks are most prevalent in the warm summer months, it’s highly recommended that flea and tick preventatives be used all year long. There’s no reason for any pet to suffer during flea and tick season!